The history of cinema is littered with career defining debuts. From Orson Welles’ seismicCitizen Kane to François Truffaut’s autobiographical The 400 Blows; from Terrence Malick’s poetic Badlands to Martin Scorsese’s raw Whose That Knocking On My Door? They don’t come often, but when they do, it is a cause for celebration, and here to join that chorus is Leah Meyerhoff ’s intimate and profound I Believe in Unicorns. 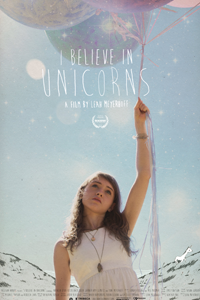 I Believe in Unicorns follows Davina (Natalia Dyer), a sixteen-year-old girl who is singlehandedly taking care of her mother, Toni (played by the director’s mother, Toni Meyerhoff ) who is bound to a wheelchair due to multiple sclerosis. But as earthbound as Toni is, Davina is not, often taken by imaginative daydreams and flights of fancy. Flights that manifest physically with the appearance of Sterling (Peter Vack), an older boy who is pure punk rock and palatable sexuality, yet he isn’t any less troubled than Davina. I Believe in Unicorns is unabashedly a coming-of-age tale, intertwining Davina’s fantasies with her burgeoning sexual desires. It is in these moments that Meyerhoff ’s knack for emotion excels. Rather than paint these nubile moments in a golden hue of nostalgia and forced profundity, Meyerhoff wraps her protagonist in desire and uncertainty, unleashing both carnally and violently. Meyerhoff achieves these moments by visualizing her story in three different forms, the first involving the cinematography and direction of the actors, which was shot over the course of three weeks on Super 16mm. Once principal photography wrapped, Meyerhoff and her cinematographer, Jarin Blaschke, received a grant from Tribeca, which they used to film experimental and time-lapse shots of nature, shots that are sprinkled throughout the movie. Finally, Meyerhoff cannibalized the actor’s costumes (notably Sterling’s leather jacket) to make small dolls, which she used to create stop-motion animation, beautifully dramatizing Davina’s inner struggle. All three forms meld together beautifully, adding even more personality to a movie that is already steeped in handmade care. For I Believe in Unicorns, Meyerhoff draws both from personal experience, as well as personal desires. When the film played at the Starz Denver Film Festival, Meyerhoff said in a Q&A that the film not only expresses her own experience, but it also functions as the kind of movie she wished she could have seen as young girl. This embrace of the alternative experience makes I Believe in Unicorns not simply a reflective movie, but an inspirational one as well. You only get one first impression, and directors only get one debut. For many, this debut comes and goes without much fanfare. Their mastery of aesthetic, personality and technique develops and deepens as they grind out movies one after the other. Yet, there are a few who come to the camera fully formed and ready to take the medium in the next logical direction. Meyerhoff is that direction. With fingers firmly crossed, I Believe in Unicorns will break through and connect with as wide an audience as possible, if for no other reason than to give Meyerhoff another crack behind the camera.